“Have you walked up the road to see the house on the corner yet?” my sister in law asked. We were at a family reunion in small town Idaho. Well, we took a walk at sunset. The shed was actually white, but glowed in the setting sun. Wow. It was a high desert garden filled with junk- no gnomes, just farm implements turned into birds, bedframes hung with mugs and vases, a bottle tree. multiple bowling balls, a shelf of trophies. Craptastic! Both of my brothers- in-law looked at it with dread, worried that they were going to wind up with a yard full of crap too. 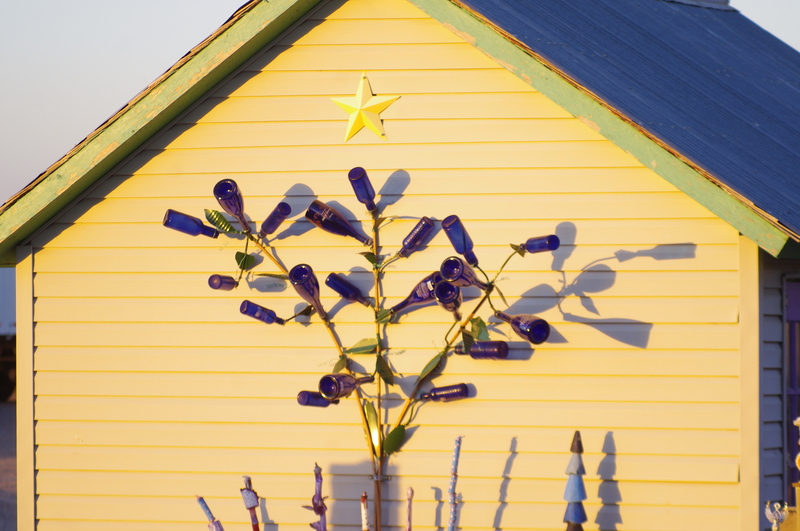 DH didn’t say anything, but obligingly took a photo of the bottle tree in the setting sun. One of the best structures was a fence around what I think is a goldfish pond- I stayed in the alley, so I couldn’t get close enough to be sure. The fence was alternating panels of sheet metal and either glass or plexi, and I bet it was designed as winter patio- not quite a greenhouse, but you would get a greenhouse effect- you could go out in the sunshine in the winter and be protected from the North wind, but still get sunshine, and since the structure was only around 6 feet tall, you wouldn’t have to get a building permit.